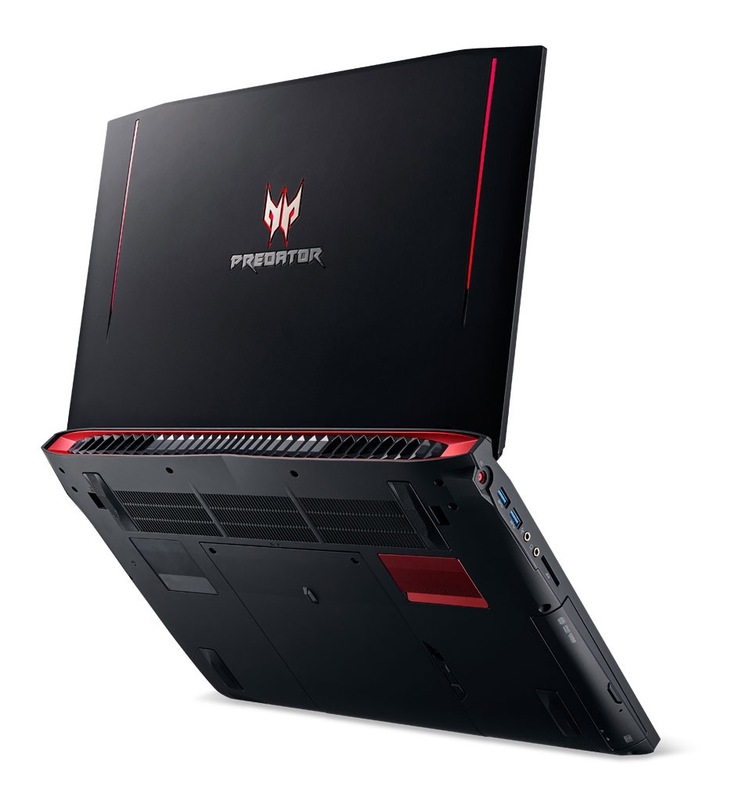 Acer Predator 15 Gaming Notebook With FrostCore Cooling: Gaming laptop are need for gamers as it portable so user can move around it anywhere while also convenient in playing. Gaming laptop always having blueprint print body of being bulky and heavy which is very hard to caring on back. As most of mainstream laptop which has very thin design and light to carry but if the question come out for gaming no one compromise with performance. As how Acer build this Predator 15 with all the gaming stuff and performance stuff to never let your gaming experience down.With 15-inch of 4K display a full gaming design body which really looks nice. From inside device include Intel Core i7 Processor alongside GTX 980M GPU 4GB of VRAM, 32GB of RAM and 1TB HDD and 512 SDD while looking these info’s you can image how this device powerful and how its performs. Ports on the device is pretty enough uses with ports including USB 3.0, USB Type-C, Thunderbolt 3, HDMI Port and SD Card slot. One nice improvement in device which will we discuss in our review so let’s get started. 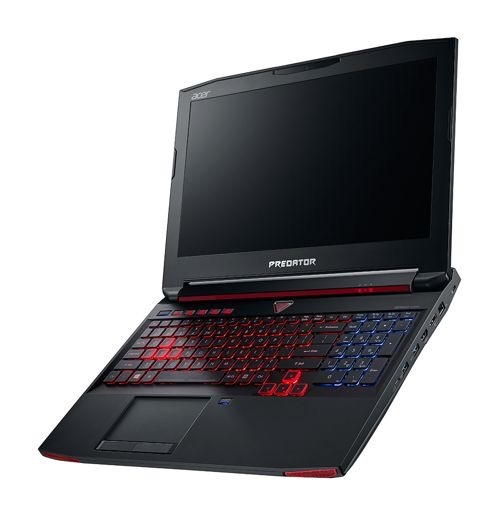 Acer Predator 15 is gloom by red light which gives a dynamic experience while using laptop. The design elements in this device not much new you found in gaming PC with sturdy design and edge like structure which really made design of this notebook really small. While material in this device has not great enough as it has Plastic material with Shark like fins which really add great design element. Material is really stain resistance as fingerprint won’t appear on device while using for long hour. Trackpad of the device is also made imprint resistance so playing longer time wont retain print on the device. Keyboard of Predator is much like other gaming Notebook with multi color light to signifies each specific part of keyboard. On the side Acer Predator 15 include a 2xUSB 3.0 port, Type-C port, 3.5mm Headphone Jack MicroSD card slot, Power Port and Optical drive which is a hybrid one. While on the other side you see a Lan Port, Thunderbolt 3 Port, HDMI Port and 2xUSB 3.0 Ports. While Camera include 720p for Video Calling and other feature. As device is optimal as compared to other gaming laptop while weight can be more light as holding device to long can caused strain in hinds while carry it along also fell something. Size & Resolution: Display of the device is really awesome with 15.6-inch immersive 4K display with Active Matrix TFT Color LCD which really make your gaming experience awesome. From first impression of device looks fantastic Playing Movies or Games really great more richer content. Display of the device has optimum and balanced part of all display configuration including contrasts, brightness, Color balancing, RGB configuration and color reproduction are good. Resolution: As we talk about display spec this device include a 3840×2160 resolution which gives greater rich display experience. Display is non touch panel so sorry for Windows 10 Pen and Paper usage are not work here. 15.6-inch display comes with IPS panel which gives a nice experience upto 178 degree. Graphics of this device also include Nvidia G-Sync technology which is also nice add up to device while playing games on G-Sync certified display’s give phenomenal refresh rates and nice content. Hardware of this device is filled with all specs maxed out as we start from Intel’s Sixth Gen Skylake Processor with Nvidia GPU which all together gives non stop gaming experience and never let you down in gaming. Ports on this device is too much which we discuss earlier. Memory of the device include a DDR4 RAM which clocked 2133MHz which is very fast and responsive. Storage of the device include two dive hybrid in device include SSD and HDD which has PCIe Slot while device also has M.2 PCIe slot which is also very nice. Processor: Hardware include Intel Skylake Core i7-6700HQ which is Quad Core CPU clocked at 2.6Ghz, 6MB cache Turbo Clocked at 3.5Ghz which is optimal for all gaming and task you put to it. Graphic: Graphic of the device is seriously insane Nvidia’s Geforce GTX 980M 8GB of VRAM GDDR5 so all games are be aware from this as it takes it all till now. While clubbed with Intel’s HD 530 Graphics which does optimisation on Windows experience. Memory: Memory on the device include a 32GB DDR4 clocked at 2133MHz which can be expandable to insanely 64GB of DDR4 so this is very fast and fluid each level. Storage: Storage in this device include 512GB of SSD and 1TB of HDD to storage your all gaming stuff. While 512GB SSD uses PCIe NVME Samsung SSD which is very fast than normal SDD’s while 1TB of HDD also include 7400RPM HDD. Ports: Ports on the device include 4xUSB 3.0, 1xUSB Type-C,1xThunderbolt, Display Port,HDMI Port, Ethernet,SD Reader, Headphone and Microphone Jack. Connectivity: While Wireless connectivity is help with Killer Wireless-AC 1532 and Bluetooth V4.2. Acer Predator 15 is shipped with Windows 10 Pro in it while using interface is just nice you won’t feel any lag or hiccups hovering system. Sorry for touch based user as this device panel don’t include a touch panel so not Windows Pen, Paper Anniversary Update. While Acer has include some other feature which called as Predator Sense for configuration system performance and help you to mange system power, there is also option for changing keyboard color lighting with Predator Pro. Overall balanced configuration gives best out of this PC which made it easy to run nicely without any issue during hovering OS or Playing games. Predator 15 feature Two superb speaker with one sub-woofer which give nice sound out put. Playing games like thriller or shooting games really takes your breath away so nice and preciously crafted sound while full volume is enough to fill one room corner very easily and can extent half more. Vibration and bass experience also give more awesome experience of playing game which make you life real situation of game. Playing game as usual make your PC more hot while this device never compromise with experience as Acer has introduce a separate cooler called as FrostCore which is the best part of the device which really cools your Notebook at vey high level as liquid cooling not make its way to this notebook but inclusion may be good option. FrostCore is additional accessories which you need to purchase separately and works with ROM driver place as you remove ROM dive and plug this fan. Inclusion of all these fans make total tally of three fan but adding another cooler cost battery much. Keyboard of the Predator is same all gaming Laptop with colorful keyboard with different color pattern looks nice and awesome. While keyboard look sturdy and nice also have long life. While Trackpad on the device comes with option of two button while there is lock button for locking trackpad and made this as a Touchpad so you not wrongly click button. This also looks nice in black layout and also tough. Battery on this device give only about 3 hour 40 min in our gaming review while using simply as device for surfing or movie gives out about 6-7 hour of battery which is nice. As this device include a 8Cell, 88Wh of 6000mAh battery. While charger include a 180W AC adaptor which weigh about 600g. Gaming is the thing which is this device made for and no doubt it stand well in it. Playing games like Quantum Break, Call of Duty Advance Warfare, Just Cause 3, Tomb Raider 2016, Batman Arkham Knight and Witcher 3 all these run in good FPS around average of 60-70FPS which is really impressive for this PC. Playing game doesn’t fell any slow down not lag. Experience of sound and screen refresh rates are also nice. Playing VR content with HTC Vibe runs very nice refreshing rates are awesome so you don’t feel any headache while using VR. On the first impression this device won’t look too costly but it is as Intital Configuration of the device include Intel’s Core i5 6300HQ Quad CPU with Nvidia GTX 970M 3GB of RAM. Display is also a F-HD, memory of the device include 32GB of RAM with all same configuration. This model is priced at $1599. While unit we are using it cost around $2699. Acer Predator 15 nice gaming laptop but won’t stand against its price as there is no luxury material or any wonderful hardware is put on this device. But Acer has nice approach to this device with more sturdy design, more lighting especially red color and material used. Hardware spec of the device looks nice in the spec sheet but in real situation this device also works nice. Acer new cooling technology also plays nice game to bring this laptop different from other counter paths as it really nice cool laptop. No doubt this heavy gaming gear is excellent in its performance that’ll never disappoint you to high-end games but if i look in market its price really too expensive as compared to other counterparts.